Mardi Gras Madness was the theme of the cooking class I went to today at Grace-Marie’s Kitchen at Bristol Farms in Manhattan Beach. The wonderful thing about Grace-Marie’s classes is that she makes you feel like your best friend invited you over for lunch and went all out with the food, the decorations, the white china, the whole works. The sunlit classroom is homey, with warm colors and artwork, and you sit at communal tables with tablecloths and seasonal decorations down the center. You’re with convivial companions and fellow foodies, anticipation building as you watch Grace-Marie cook, and smell the delicious aromas wafting from the stove and oven. Grace-Marie does extensive research on what she is going to cook for each class’s theme, and she tries to make dishes that are new, interesting, and cutting edge. *(Please see Note below). Of course she has all of the Bristol Farms products at her fingertips, which doesn’t hurt. Today, as the theme was Mardi Gras, she talked about Cajun seasoning. She suggested we use one without salt, and if we couldn’t find one, to email her and she would send us a recipe to make it ourselves. She is so accessible and willing to help her students. While Grace-Marie is cutting and chopping, she keeps up a running conversation with all of us students. I’ve never seen anyone who was so adept at keeping her hands working, checking the recipes, knowing how what was in the oven was doing by how it smelled, and popping up with little tidbits of info like, “Do you like Zydeco music? Do you know that Zydeco comes from French for green beans; actually, the Creole accordion and washboard music they played on the porch when they cleaned the green beans.” And then a discussion about Fat Tuesday and the goofy commercials on the Olympics. Just like in your best friend’s kitchen, sharing the friendship. 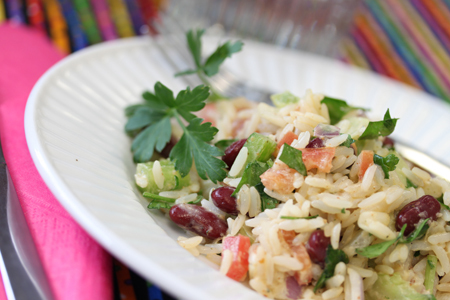 First we had this tasty Cajun Red Beans and Rice Salad. The vinaigrette was zingy with lemon juice, Creole Mustard, Tabasco Sauce, garlic and Cajun Spice mix. 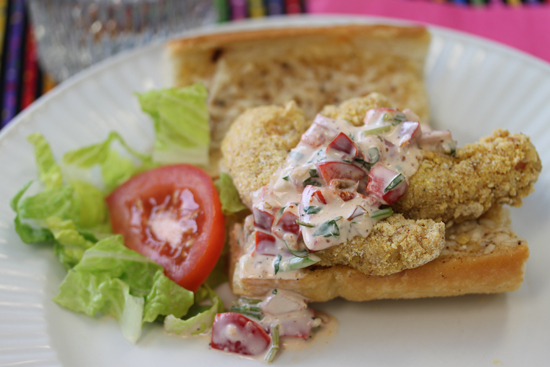 Then we were served the Mardi Gras Po-Boy Sandwiches with huge cornmeal-crusted shrimp and an amazing Red Pepper Remoulade, which included Stonewall Kitchen Red Pepper Relish, on French rolls crisp with butter and grated Asiago cheese. Everyone in the room was groaning with happiness at this point. The sweet shrimp, the spicy remoulade, the crunchy cornmeal, the salty cheese and the crisp buttery bread. This covers all the food groups in my book. While everyone was eating, Grace-Marie introduced me and talked about my food blog. Everyone was very enthusiastic and wanted to read about Grace-Marie on-line. They also wanted to see themselves on my blog. So I took photos while they ate, which I think next time I’ll have them get in a big group and say cheese. But here you are, fellow students, I did my best. *Note: Grace-Marie asked me to tell you that the St. Patrick’s Day Dinner on March 9, with the Irish Farm House theme, is NOT corned beef and cabbage. I repeat, there will be NO corned beef and cabbage for St. Patrick’s Day this year. There WILL be a gourmet Irish salmon dish with appropriate accompaniments. 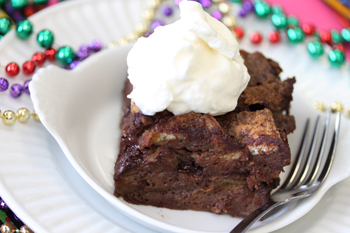 And finally the dessert, French Quarter Chocolate Bread Pudding. I have to tell you, this is the most chocolate-y concoction I have ever eaten. Grace-Marie says she uses Broguiere’s Chocolate Milk in her recipe, which comes in a glass bottle, and is the richest chocolate milk on the planet. The photograph cannot do justice to the way this stuff tastes and its soft custardiness. If you are a chocoholic, this is what they feed you in heaven. You must make this recipe. For more information about the cooking classes visit Grace-Marie online at Bristol Farms or email her at gmj@bristolfarms.com. 1. Whisk together the eggs, chocolate milk, cream and liquor..
2. Stir in both sugars and the cocoa powder, vanilla extract, almond extract and salt. 2. Scatter the bread and chocolate into the casserole. Gently pour the custard over the top. Press down lightly so that all of the bread is coated with the custard. Set the casserole at room temperature for 30 minutes to absorb the custard. 3. Bake until the custard is set (a wooden skewer comes out the center clean) and the sides and top are golden brown (1 hour). Cool for 30 minutes before serving or cool to room temperature, cover and refrigerate. Bring to room temperature or reheat when ready to serve. Serve: Cut portions onto individual plates. Serve plain with purchased caramel or chocolate sauce… or with sweetened whipped cream…or vanilla ice cream… or all of the above! 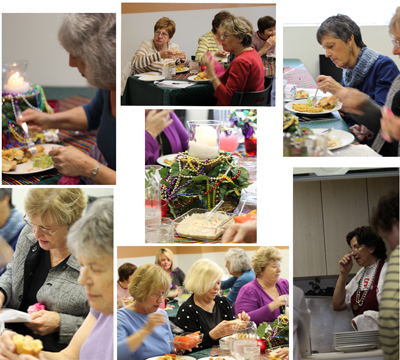 I am so pleased to see how much you enjoy attending Grace Marie’s Kitchen cooking classes. 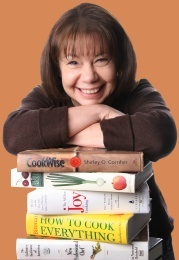 They are the best and her ability to create the wonderful meals she does is out of this world. She lives and breathes her passion 7 days a week. I should know as I have done the dishes for her at this school at least 15 years. I am glad she is getting more exposure through sites like yours. Good for you, I enjoy your site, your comments, and outstanding photos! I definitely will check in with you daily to see what you are up to! I have to agree with Pam (her comment is above). Grace Marie’s Kitchen cooking classes are really great. I attended this class, and it was wonderful. I loved the bean and rice salad and the Chocolate Bread Pudding was divine. I’ve made it twice now and I’ll make it again. My family can’t get enough of it. Thank you also, Lynn, for doing this great job. Your writing and your photos are just great. Hope to see you in another class real soon.